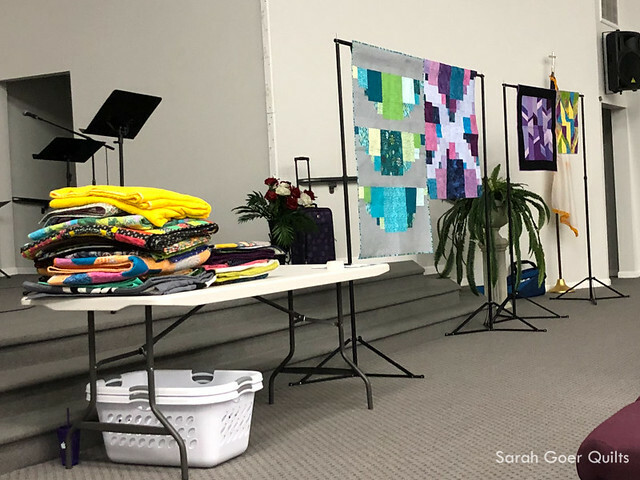 Last week I traveled down to Tehachapi for a visit to the Tehachapi Mountain Quilters. I met the program chairs from the group last April at the SCCQG Meet the Teachers event. After a long drive, I rolled into town on Sunday evening, ready to join them Monday morning for their guild meeting. My new Island Batik scarf made it's debut since it was the perfect match the my top. 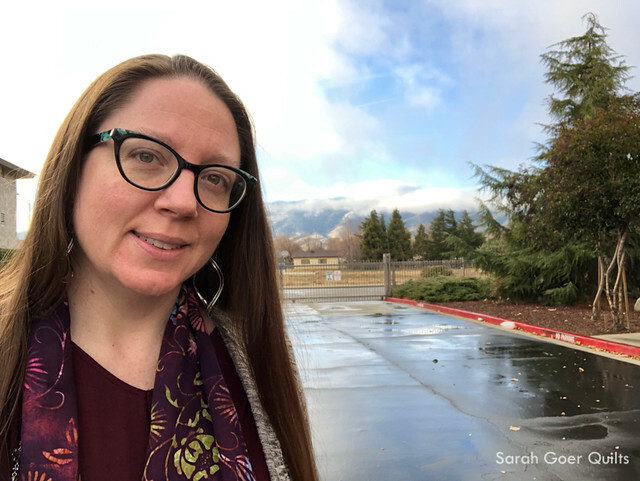 I couldn't resist stopping for a quick photo of the beautiful mountain view on my way to the meeting. 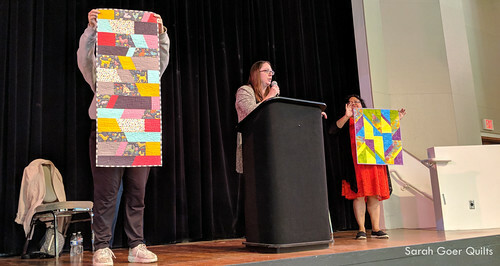 I shared my My Quilting Journey lecture with a large pile of my quilts, spanning from my first quilt back in 2002 (I think) to many of my recent Planned Improv and other quilts. 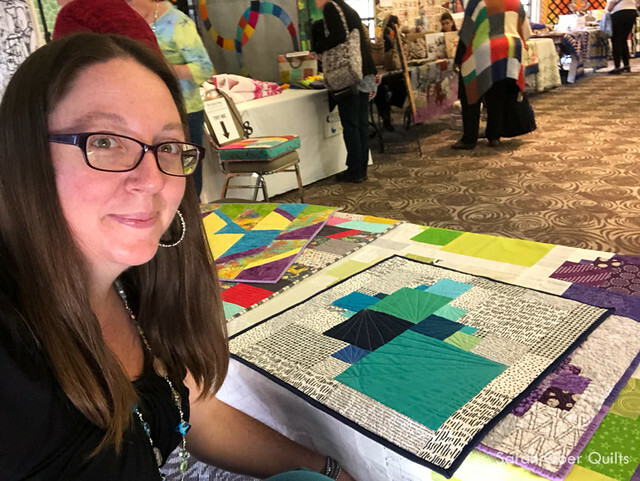 This lecture is show and tell of around 25 quilts, sharing my tips and tricks along the way. 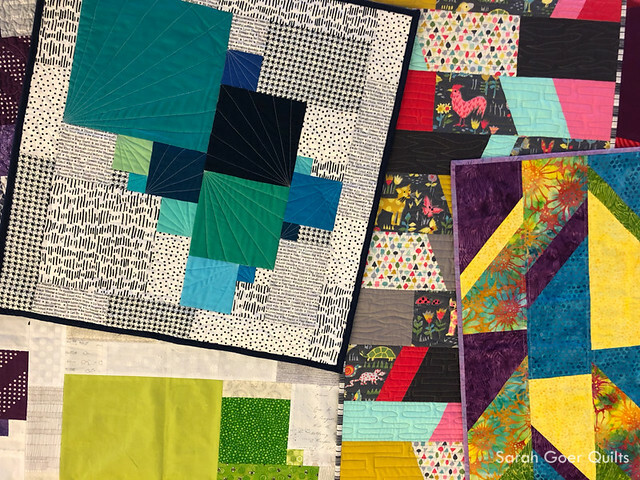 The quilts you can see hanging are some of my recent Planned Improv pieces: Fandangle Scrappy Squares, Modern Batik, Pantone Ultra Violet All About Angles, and Bold and Brave. Following the guild meeting I had lunch with a group of the women from the guild and then visited Yvonne. 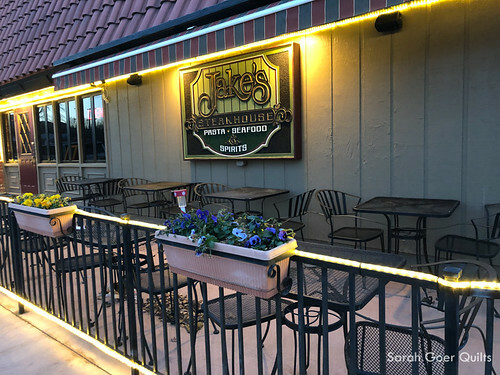 I ended my day with some delicious chicken pasta from Jake's, which was walking distance from my hotel. On Tuesday I taught Planned Improv: Scrappy Squares. It's so fun how versatile Planned Improv is. Anna work in progress and Angie's first finished slab are shown above. 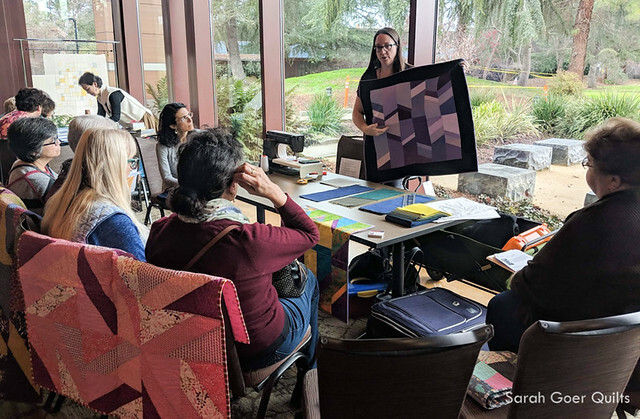 During the workshop I had students making baby quilts, wall quilts, table toppers, and placemats. Part of my Planned Improv workshops is talking about how to iterate on a design and in order to build another unit that looks like it belongs with the first. 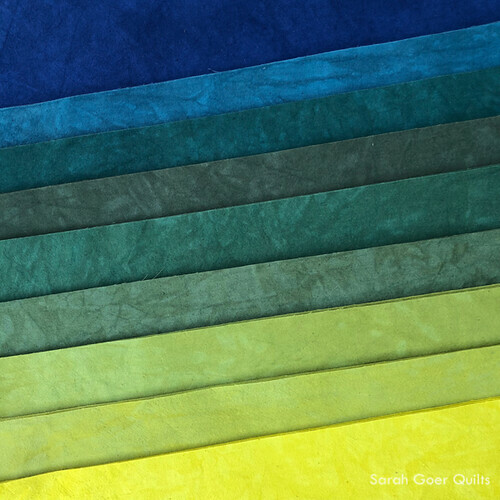 This is applicable when creating larger sized quilts with multiple slabs, like my Greenery quilt, as well as working in a series to create a set of placemats that aren't identical, but do go together. 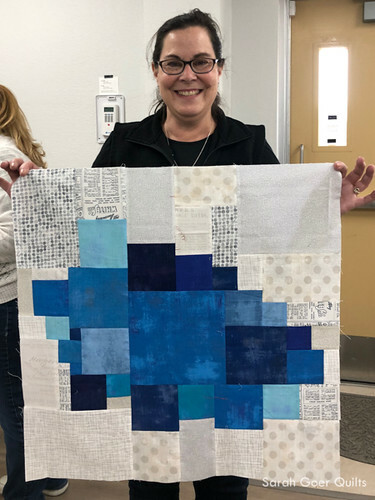 Gina used a variety of blue Grunge fabric with soft greys in her background. They she chopped up her finished slab and rearranged the quadrants to create a different composition. 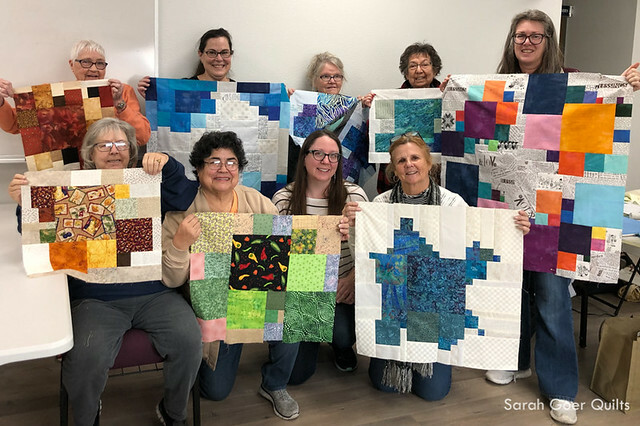 I had a lovely day with this great group of women who all finished one or more slabs. 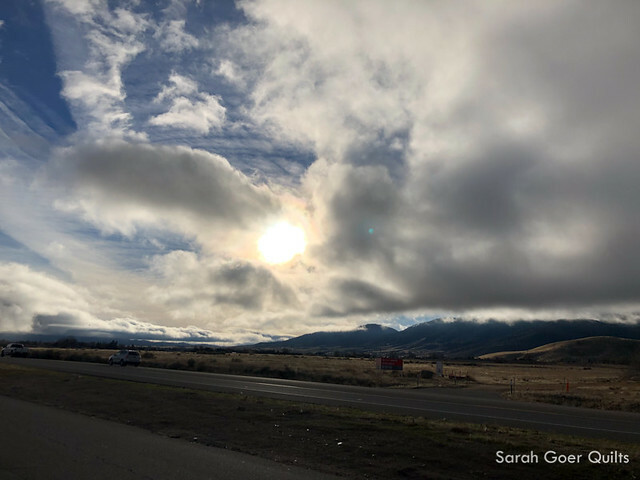 A great big thanks to all of the Tehachapi Mountain Quilters for having me, and to Beve and Nancy, the current program chairs, who took care of me while I was there. Would you like to have me visit your guild to teach? Point your guild program chair to my teaching page for details about the lectures and workshops I'm currently offering. Check my teaching schedule to see if I'll be in your area. Posted in Quilting. 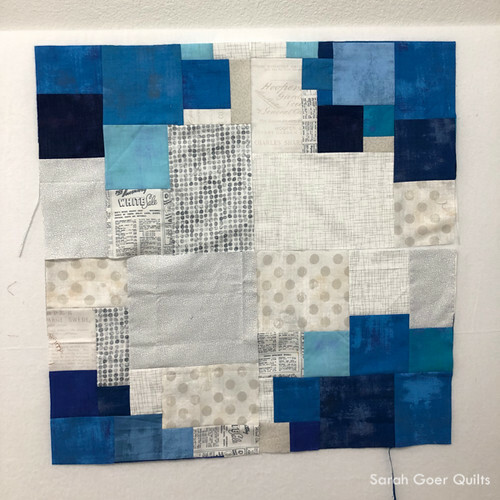 Tags: lecture, planned improv, scrappy squares, teaching, Tehachapi Mountain Quilters, workshop on January 17, 2019 by sarah. In April I had the honor of presenting at two Meet the Teachers events in California. 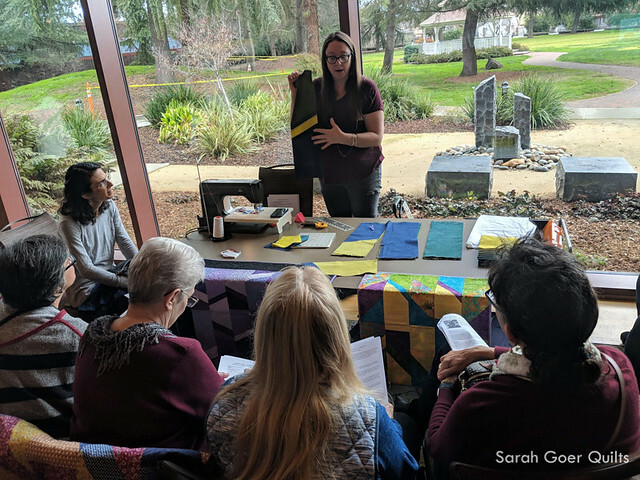 First, I attended the Northern California Quilt Council event about an hour from my house. 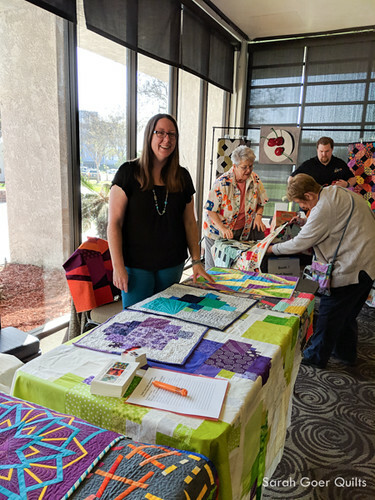 Later that week I flew down to Long Beach to attend the event hosted by Southern California Council of Quilt Guilds. The general idea of these two events is similar, though the Southern California event is larger scale. In both cases, the participating teachers have a booth or table space to display their workshop offerings and promotional materials. Each teacher is allowed three minutes on stage to give a short spiel on their workshop and lecture offerings and there is time for guild representatives to circle the room and speak one-on-one with the teachers. I attended NCQC Meet the Teachers in 2017 as an observer with my guild program chairs. It was helpful for me to have an idea of how the event is run so I would know what to expect. That information, together with insight from my friend Mel, was very helpful in preparing for attending as a participant this year. Some teachers had a much more elaborate setup than I did, but I had all the necessary items covered. 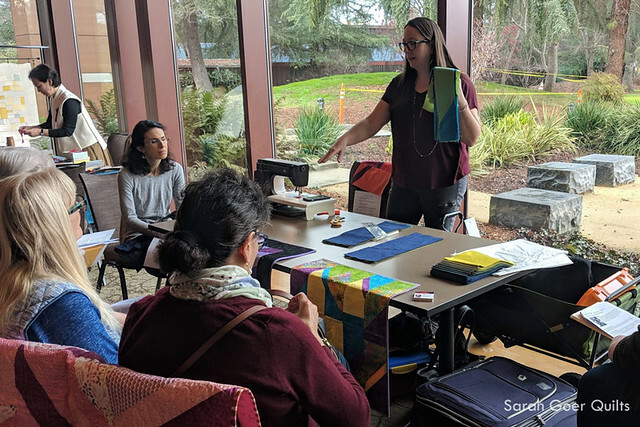 I brought sample quilts, postcards that included photos of my workshop offerings, and a signup sheet for my newsletter. The one thing I'd definitely add next time is a quilt stand for hanging a quilt behind me at my table. 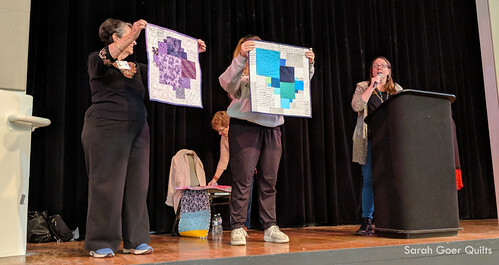 On stage the volunteers hold up each teacher's class sample quilts while the teacher gives their spiel. (Quilt holders are the best!) 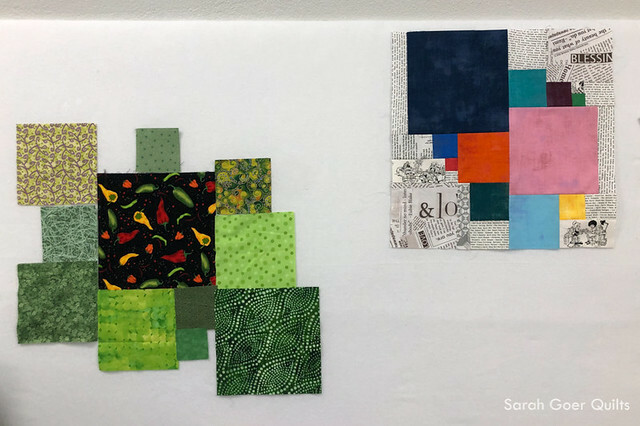 I shared about my two Planned Improv workshops, Scrappy Squares and All About Angles, as well as my three lecture offerings. At my table I had a few more samples for people to see. And I gave the 30-second version of my spiel to the guild representatives who came by the table. For the Southern California event, I traveled with my friend Mel Beach. (Thanks to her for snapping a few pictures of me!) You can read more about the fun we had in her recap of the events. A great big thank you to all the NCQC and SCCQG volunteers for hosting Meet the Teachers! It's such a great opportunity and both events ran so smoothly. 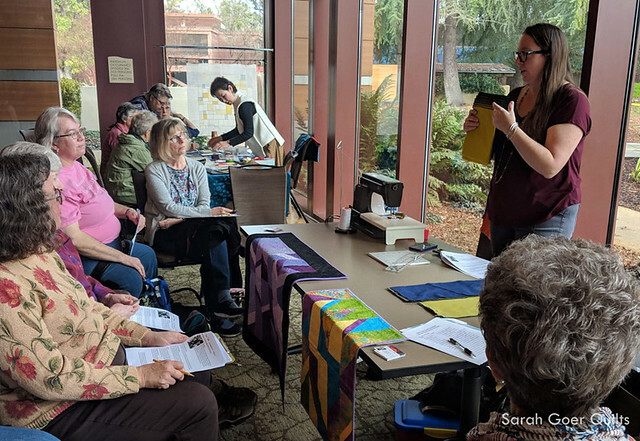 Also, thank you to all of the guild representatives (some of whom traveled quite a distance) for attending the event, and for stopping by my table to chat. I'm curious. For those of you who live outside of California, are there organizations hosting events like these in your area? Posted in Quilting. 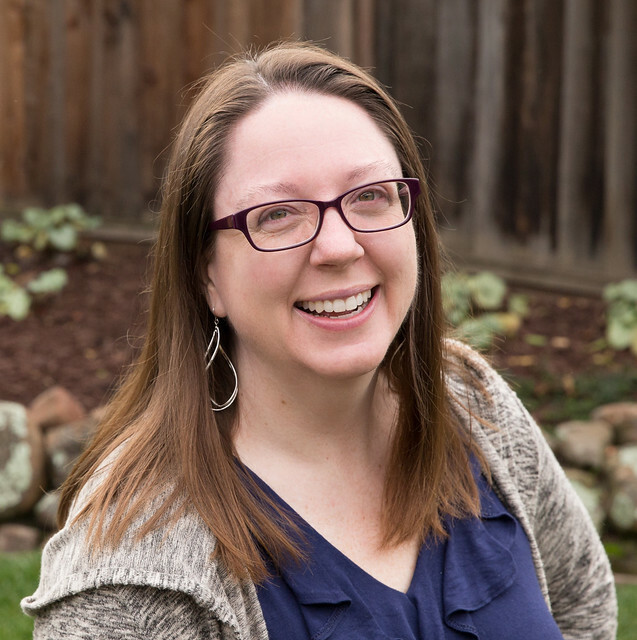 Tags: meet the teachers, planned improv, scrappy squares, teaching on May 3, 2018 by sarah.